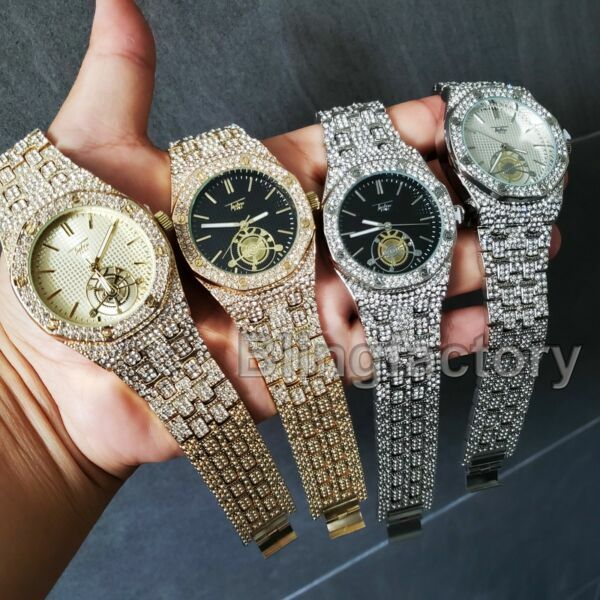 eBay Luxury Men's Iced out Rapper's Lab Diamond Metal Band Dress Clubbing wrist WatchFeatures:100% brand newFinish: 14K Gold, White gold PlatedCase Back : Stainless SteelMovement: Quartz JapanBattery included.Case Size : 40mm X 40mmWeight: 157 gramsLock: Fold Over Gender: Men'sRemovable Links (Adjustable)Lab Diamonds Luxury style** Gift Box Included **Payments:US Customers: Paypal acceptedInternational Customers: Paypal acceptedShipping:We combine shipping!We ship via USPS (Post office) First Class Mail.Approximate Delivery Times:US: 3-5 BUSINESS DAYSCanada: 1-2 weeksEurope: 1-2 weeksSouth America: 2 weeksAustralia: 2 weeksAsia: 2 weeks We do everything possible with the packaging to ensure it arrives to you in perfect condition. If you have any questions please feel free to ask. Returns:100% Satisfaction Guarantee!Exchanges: We replace defective items if sent back within 7 days upon receipt.Lost or Damaged Items: If insurance is purchased, items will be reshipped absolutely Free of Charge. (Damaged goods must be sent back)Refunds: If the item is in new condition, we can accept returns less s&h charges and a 20% restocking fee.Please email first for return authorization.